Wolves are majestic animals that once roamed throughout the world. As human settlements and hunters entered their territories, wolf populations have declined or even been eliminated. The English wolf, once known throughout the British Isles, is now extinct. Wolves arrived in the British Isles at the end of the Ice Age, approximately 10,000 to 12,000 years ago. Packs of wolves followed the migrating herds of deer, boar and grazing animals as they moved north. The earliest known evidence of wolves' interactions with humans is from a 6th-century Pictish carving of a wolf, found in the Scottish Highlands. Skeletal remains have confirmed that wolves lived throughout the British Isles, including England, Scotland, Wales and Ireland. Historical accounts from as early as 1,000 years ago mention wolf hunting as a way to pay tribute to kings and nobles. Servants to the kings could be granted land on the condition that they rid the land of wolves. Wolf-hunting parties were often organized by kings and nobility. Even Mary, Queen of Scots, reportedly organized and participated in wolf hunts. By the turn of the 16th century, wolves were extinct in England and Wales. However, they held for for longer in other parts of the British realm. 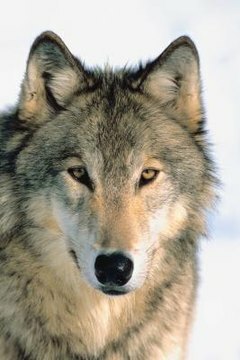 In Scotland, wolves survived almost 200 years more, despite regular wolf hunts organized by nobility and decrees by Scottish kings for their destruction. Wolves held on in Ireland until the middle of the 18th century. By 1760, the English wolf in the British Isles was completely exterminated. In the last 50 years, ecologists and conversationists in the United Kingdom have debated the reintroduction of wolves. The English wolf was a subspecies of the grey wolf, which is the most common species of wolf. Reintroduction programs would likely bring wolves from mainland Europe, where the grey wolf is already making a comeback. One study conducted by scientists from the UK and Norway suggested that reintroducing wolves into the Scottish Highlands could help control deer herds, preserving the forest ecosystem from destruction as a result of deer overpopulation. The Northumberland National Park in England and Cairngorms National Park in Scotland are also considering the reintroduction of wolves. The Independent: Back from the dead: Could wolves and wild boar roam Britain again?